PORTLAND, Maine — Lois Dodd, who was born in 1927, is one of this country’s most underrated painters. She was part of the generation of artists who were obliquely connected with Abstract Expressionism and then Pop, but who were more inclined to varieties of figurative quietude. One thinks of Fairfield Porter, Neil Welliver, Yvonne Jacquette, and Dodd’s lifelong friend Alex Katz. Dodd didn’t have a retrospective until 2011, when the Kemper Museum for Contemporary Art, in Kansas City, Mo., and the Portland Museum of Art together mounted “Catching the Light.” That show included this Dodd self-portrait, which Portland owns. There’s something self-replenishing, something endless about it. It never exhausts looking. It helps, no doubt, that it’s so bright and fresh. You don’t often see a painting with so much of the particular green Dodd has used for the house’s siding. 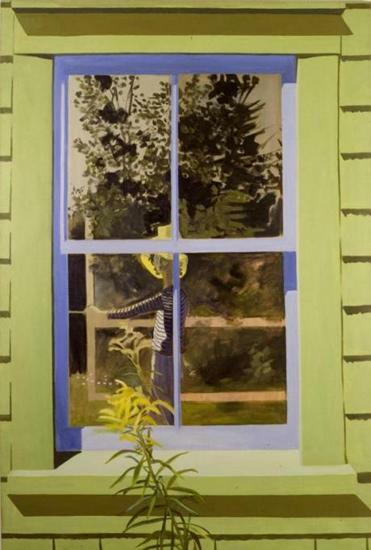 It’s a sort of dull chartreuse, shifting toward yellow, and it is given a sharp, citrusy zing by the bright yellow of the flowers, the contrasting dark greens of the reflected trees, and the two shades of blue on the window frame. I’ve talked about color, but what’s just as extraordinary is the light. Notice the way Dodd, with utmost economy, suggests the searing intensity of sunlight with her treatment of the shadows on the window frame — and especially the siding. Each horizontal shadow has a broken lower edge, suggesting uneven edges in the overlapping panels. Only strong sunlight creates that kind of shadow precision. Exquisite, too, are the variations in light reflecting off the slender, pinwheeling leaves of the green stem in the foreground. These are all formal qualities, and I dwell on them to delay my attempt to express the picture’s emotional effect. Why is that so hard? Because the mood is so elusive. It is a painting of surfaces and reflections, but it powerfully suggests interior life. The light is beneficent; but the artist’s view of herself is reflected in a window, obscured and obstructed by the window frame; diminished by distance. So it is a painting to bask in, but also to feel unsettled by. It would make a great cover for a volume of Alice Munro short stories. For me, it suggests both the sensual immediacy of daily existence, and the difficulty, perhaps the impossibility, of grasping the essence of any self.